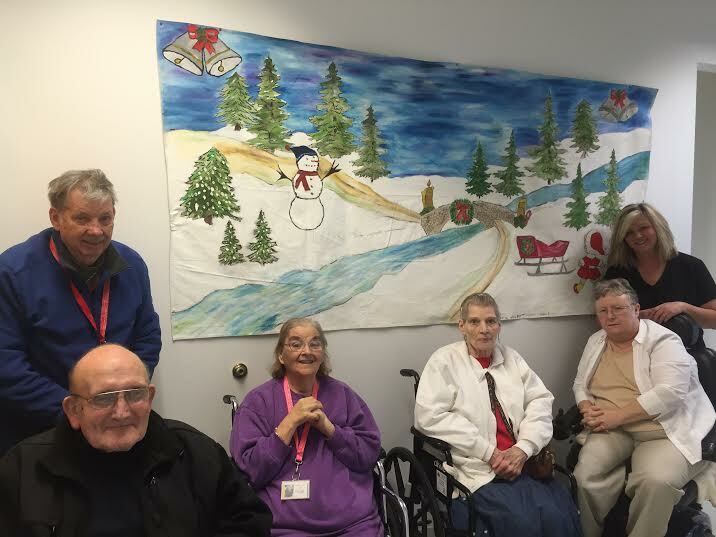 AllCARE for Seniors PACE participants recently transformed an eight foot canvas into a gorgeous winter-themed work of art. This mural was designed by AllCARE participant Scarlett Baker. Ms. Baker is an extremely talented artist who has been gracious enough to share her gift with others in the AllCARE program. Together, these talented individuals worked over four weeks to finalize the winter scene complete with a sleigh, a snowman and a beautiful rock bridge over a flowing river. Ms. Baker has recently started teaching an art class weekly to the AllCARE participants. Currently, the AllCARE participants are working on a Spring mural. The seasonal murals will be on display at Appalachian Agency for Senior Citizens’ main office in Cedar Bluff, Virginia. Participants who worked to complete the winter mural project include, Scarlett Baker, Donald Durham, Susan Helton, Lawrence Brown, Rachel Christian, Mabel Henderson, Linda Dye and Teresa Reynolds. AllCARE for Seniors is a Program of All-Inclusive Care for the Elderly (PACE) under the umbrella of Appalachian Agency for Senior Citizens. PACE is a long-term care solution for individuals who need help taking care of themselves at home. PACE programs provide health care and social services for older adults who need nursing home services but want to continue living with in their homes and communities. For more information concerning AllCARE for Seniors PACE, please contact 276.964.4915..